A hi-tech computer lab to make the students tech-savvy and to keep them abreast with the latest techniques that teaches not just computer as a subject, but also, the integration of computer skills for learning of other subjects in the curriculum. The school supports an education system that emphasizes experiential learning. The focus is on challenging the students to explore new ideas and learn by doing. 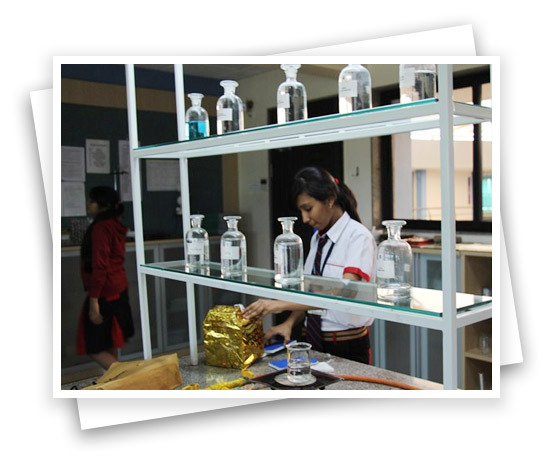 With well equipped and state of the art laboratories, the students are provided opportunities to question, explore, examine, hypothesize and draw inferences thus building a scientific temperament. The language lab is the School's foray into successful implementation of novel teaching methods to cultivate effective language skills in its students. Curriculum Designing, including the use of audio- visual aids, is a crucial aspect of the teaching process. The Language Lab of the school with the facilities for audio and video recordings and analysis is very useful for honing students' skills. It houses state-of- the-art equipments and a well- stocked reference section in the form of audio and video cassettes, magnetic tapes, slides, documentaries and films pertaining to various foreign languages. This material is extensively utilized in designing the programs for teaching of languages.